Shana began her athletic career as a competitive swimmer. In her almost 20 years of swimming she has achieved many records and honors including All American, State Champion, and National Qualifier. After college she began competing in endurances races including triathlons, marathons, and obstacle course races. She is a three time Boston Marathon qualifier and in 2013 she completed a 50 mile ultra-marathon. Shana began her coaching career in 2002 as an age-group swim coach. Since then she has been certified and taught indoor cycling, group fitness, and shallow water fitness. Shana has a B.S. in Counseling from The University of Scranton. Shana believes that sports and fitness have more to do with your mental health than your physical ability. She uses her degree to understand the psychology of her athletes, motivating them to build mental toughness believing that with mental toughness comes physical strength. Shandra began her athletic career as a competitive swimmer seven minutes before her twin sister, Coach Shana. Shandra swam Division III swimming at Widener University and to date still maintains many of the school records. After swimming, Shandra began searching for something to fill her competitive fitness void. She spent long hours in the gym with limited results until she discovered CrossFit. She found what had been missing; a supportive community with friendly competition and true fitness. If Shandra is not at the box working out you might find her kayaking, biking, or running somewhere. Maria has been doing CrossFit for over eight years. She is a special education teacher teaching for 22 years. Her previous athletic experience has been a high school and college basketball player. Maria has over 20 years of head-coaching high school girls basketball. Maria fell in love with CrossFit and only wished she had it when she was a younger athlete. Maria's passion is coaching the newer athletes and see them progress in their fitness and their love of CrossFit. 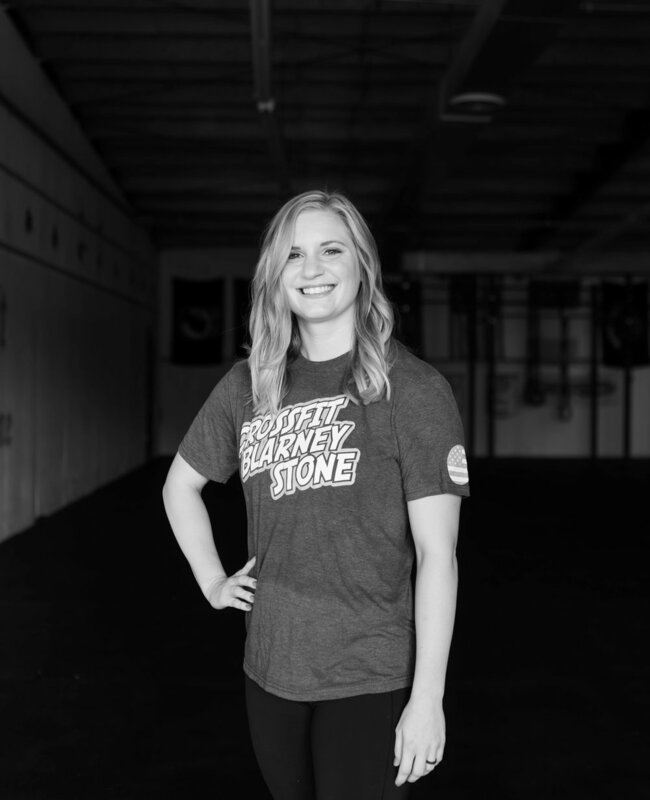 Ryann joined CrossFit Blarney Stone in 2015 after returning to the area upon completing her J.D. Ryann quickly found that CrossFit was the most effective and fun way to work toward achieving her fitness goals. Now as a coach, Ryann loves sharing her experiences and perspective with members looking to also make positive changes in their lives. Ryann enjoys testing the abilities she has gained through CrossFit by doing races or competitions. Her favorite WODs include heavy lifts or odd objects. Lizzy was introduced to dance in her toddler years. She studied ballet, jazz, hip hop, tap and lyrical. When she was 22 years old she was introduced to yoga as a way of maintaining her flexibility after her years of competitive dance were over. In 2014 Lizzy discovered CrossFit when she decided to step away from the gym and into a box. It was unlike any other type of workout she experienced. CrossFit incorporated her love of dynamic movement found in dance with an attention to alignment found in yoga. Lizzy holds her Yoga Teacher certification at the 200-hour level from InfinitYOGA. Lizzy believes in teaching yoga for athletes instead of to athletes. Her classes are designed to develop an athlete’s mobility, find proper alignment, gain balance and help them be mentally ready for their next workout. She structures her class around the week’s programmed WODs in order to help relieve any sore muscles and overall body fatigue.